It sounds like Solo: A Star Wars Story has set a Chinese release date, and fans aren’t going to have to wait long to see the movie. There is usually a wait between the release dates in the west compared to the east, but this time Solo arrives on the same day. According to Variety Solo will be arriving on in Chinese cinemas on the same day as US cinemas: May 25th. China has become one of the biggest markets for movies, but they don’t seem to enjoy Star Wars that much. All three of the Disney era films have had a hard time finding an audience in China. The Force Awakens did well, but the other two films haven’t found the numbers that a Marvel movie usually finds in China. The original “Star Wars” franchise was not screened in China until several years after its initial release in other territories. Contemporaneous screening of the newest episodes began in the new, modern era of Chinese cinema in 2016 with the release of “The Force Awakens.” That film earned a very respectable $124 million from its Jan. 9, 2016, release. “Rogue One,” released on Jan. 6, 2017, grossed $69.5 million, and “The Last Jedi,” released on Jan. 5, 2018, slipped to $42.7 million. 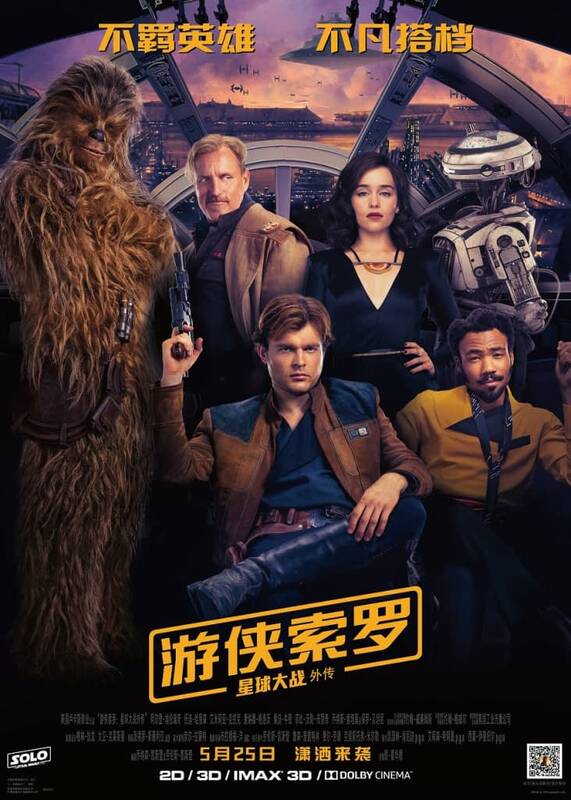 Whether or not Solo will be a different story is still up for grabs, but one thing is for sure the new Chinese poster is a photoshop nightmare. It’s another one of those times where the lines between the characters are obvious, and it’s very clear that these are a bunch of images smashed together. While that can look good sometimes, this one really doesn’t.